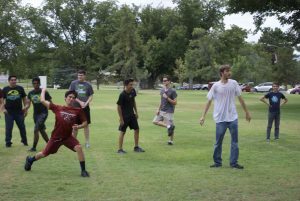 NMSU’s 2017 Summer Camp was held July 10 through July 14, 10 am to 4 pm, and attracted fifteen students. Ages and grade levels ranged from 13 to 17 and 9th to 12th, respectively. Students explored various physics topics, including mechanics, electricity and magnetism, and spectroscopy. Each morning, there were brief lectures pertaining to the day’s topic, followed by related hands-on activities and projects each afternoon. 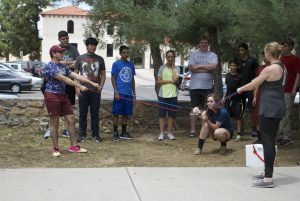 On the final day of camp, students applied various concepts they had learned throughout the week to learn to successfully aim and fire a water balloon slingshot. An impromptu water balloon fight followed target practice, pitting the camp counselors against the students, who emerged victorious. 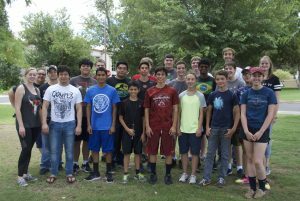 This summer camp was supported by the NMSU Foundation (Dr. Horace Coburn Physics Endowed Fund) and by the National Science Foundation (DMR-1505172).